These popular restaurants have been featured on The Food Network. Toronto is firmly on the worldwide foodie map and it’s a city that offers much in the way of culinary variety. Some of the city’s eating establishments are so well-loved that they’ve been featured on various Food Network shows. Here are 10 Toronto restaurants that you might have spotted on either "Diners, Drive-Ins, and Dives," "Eat Street," or "You Gotta Eat Here!" How many have you eaten at? Banh Mi Boys appeared in season two of "You Gotta Eat Here!" The ultra-popular spot for creative takes on banh mi, tacos, and steamed bao offers affordable, tasty grab-and-go eats that are full of flavor. Some popular options include the pulled pork banh mi, grilled chicken taco, five-spiced pork belly steamed bao and the kimchi fries. Fanny Chadwick's, purveyor of contemporary comfort food, also appeared in season two of "You Gotta Eat Here!" The menu here focuses on locally sourced, seasonal dishes and everything you eat is prepared in-house, from the condiments to the sodas to the clamato for their Caesars. One of Toronto’s most well-known food trucks, the Fidel Gastro food truck (nicknamed Priscilla), appeared on season four of Food Network’s Eat Street. The truck doles out hearty, tasty and often messy street food, mostly in sandwich form featuring playful names and high octane flavor. 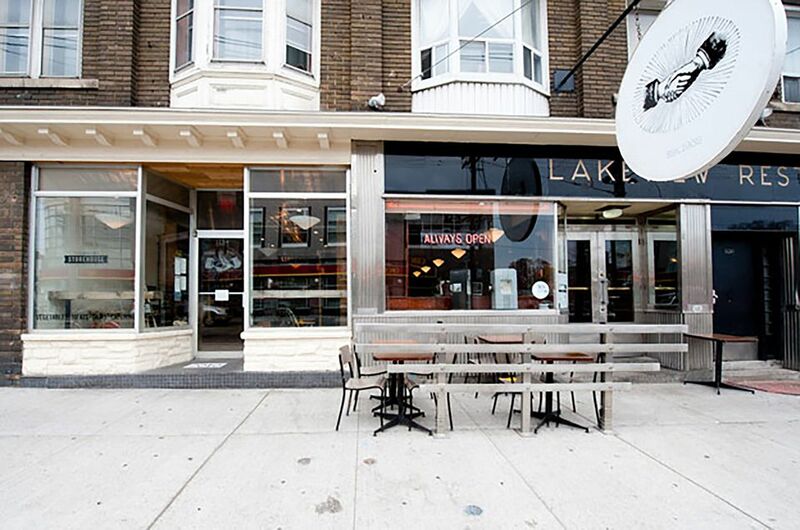 Host Guy Fieri visited much-loved Toronto diner the Lakeview Restaurant, on season 16 of his long-running Food Network show Diners, Drive-Ins, and Dives. No matter what time of day (or night) hunger strikes you can get your fix of all-day breakfast and diner favorites 24 hours a day, seven days a week at the Lakeview. Beast Restaurant, whose menu highlights local Ontario farmers and producers, was featured in season three of You Gotta Eat Here! Their dinner menu changes regularly to highlight what’s in season and dishes feature creative flavor combinations that work together to elevate key ingredients. Drop by between 5 and 7 p.m. Tuesday to Friday for Beast 120, wherein various drinks and snacks go for $5 a pop. Opened in 1996 with just a few tables, Gerard India Bazaar’s Lahore Tikka House is still going strong and was featured in season four of You Gotta Eat Here! Flavourful Pakistani curries, kebabs, biryani and tandoori naans make up the well-priced menu. Roncesvalles diner The Ace also appeared in season 16 of Diners, Drive-Ins, and Dives. The cozy, friendly spot is housed in a 1950s diner and serves dinner seven nights a week, lunch on weekdays and a very popular brunch on weekends. Their menu features creative comfort food with a focus on seasonal ingredients. Waffle-focused all-day brunch spot Starving Artist appeared in season four of You Gotta Heat Here! The perpetually packed west end spot specializes in creating breakfast favorites like eggs benny, with waffles. Everything on the menu is either on, between or in waffles, which is a seriously fun way to eat just about anything. There's a second location on St. Clair West. Buster’s Sea Cove has two locations as well as a food truck. The food truck also appeared in season four of Eat Street. Buster’s Food Truck is where you can order up Maine-style lobster rolls, crab rolls, Ensenada-style fish tacos and shrimp tacos. Justifiably popular BBQ joint The Stockyards was featured in season 17 of Diners, Drive-Ins, and Dives. They serve up authentic wood smoked Carolina style BBQ, griddle smashed burgers, fried chicken and a variety of decadent sandwiches.